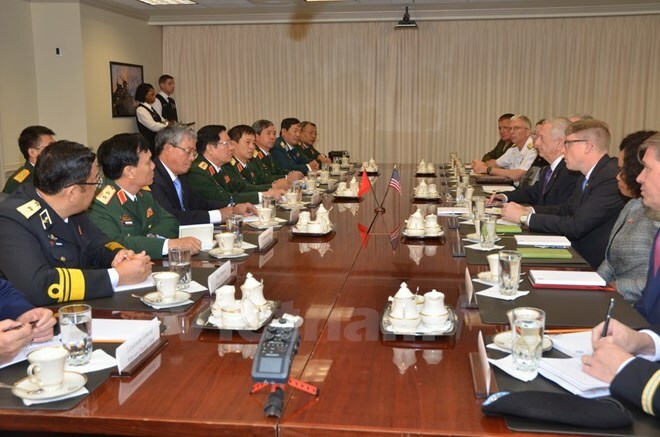 Washington D.C. (VNA) – Defence Minister Gen. Ngo Xuan Lich held talks with US Secretary of Defence James Mattis in Washington D.C. on August 8 following a welcome ceremony the same day. Lich, who is on US visit from August 7-10, said Vietnam considers the US one of the top important partners and always prioritises developing bilateral ties based on the principles of equality, respect for political regime, independence, sovereignty and territorial integrity of each country. He spoke highly of the US’s collaboration with the Vietnamese coast guards in law enforcement at sea as well as in the United Nations peacekeeping mission. The two officials hailed the outcomes of bilateral ties on the basis of the Memorandum of Understanding on promoting defence links and the Declaration on the Joint Vision on bilateral defence ties covering the exchange of all-level delegations, training, dialogue consultation, maritime security, search and rescue, bomb and mines clearance, Agent Orange/dioxin detoxification, and United Nations peacekeeping activities. They agreed to reinforce coordination under signed agreements, with priority given to post-war recovery efforts in Vietnam, response to non-traditional security challenges and the UN peacekeeping activities. About dioxin clean-up in contaminated areas, Lich said the two sides have concluded the first stage of the Da Nang airport remediation project and are embarking on the second stage to serve the Asia-Pacific Economic Cooperation (APEC) Summit 2017. They are also conducting studies to launch a similar project at Bien Hoa airport in the southern province of Dong Nai. Host and guest also talked about the upcoming Vietnam visit by a US aircraft carrier, saying that agencies concerned will further discuss the trip when the carrier meets necessary technical requirements. Mattis, for his part, lauded Vietnam for its effective joint efforts in seeking remains of US servicemen listed as Missing in Action (MIA) during the war. He pledged continued support to Vietnam in seeking remains of Vietnamese soldiers missing in the war and cleaning up the traces of dioxin at Bien Hoa airport. On the occasion, Lich handed over a new document on locations of searching remains of MIA servicemen to the host, making it easier for both sides to continue the effort.